Monster Art Studio was formed in 2001 by Jeff Riggan. 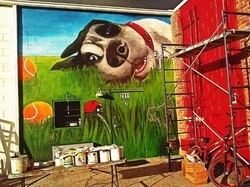 Throughout the years Jeff has painted approximately 30 murals for Orlando-based Tijuana Flats restaurants. Riggan has professionally painted and drawn for nearly 30 years. Jeff has been featured in many publications, local and national news as well as several television shows. Riggan has built sets, sculpted, painted murals and fabricated large scale artwork for UNIVERSAL, NICKELODEON, ISLANDS OF ADVENTURE, CARTOON NETWORK, SIX FLAGS and WONDERWORKS either under contract or work for hire. CONTACT US FOR ALL YOUR ARTISTIC NEEDS, We make - Backdrops, Movie/TV props, Themed rooms, custom artwork and just about anything else! !